BigTime Literacy: feeling extra 'coachy' this week! This week has been great so far! A few weeks ago, Christine, one of our reading specialists and I, presented to our staff: The Power of the Mini-Lesson. You can see our presentation here. We had let the teachers on our campus know that in a few weeks from that time, we would come around and give feedback about the mini-lessons. Well that week is this week and I've loved watching our teachers execute awesome mini-lessons in as little as 9 minutes flat! 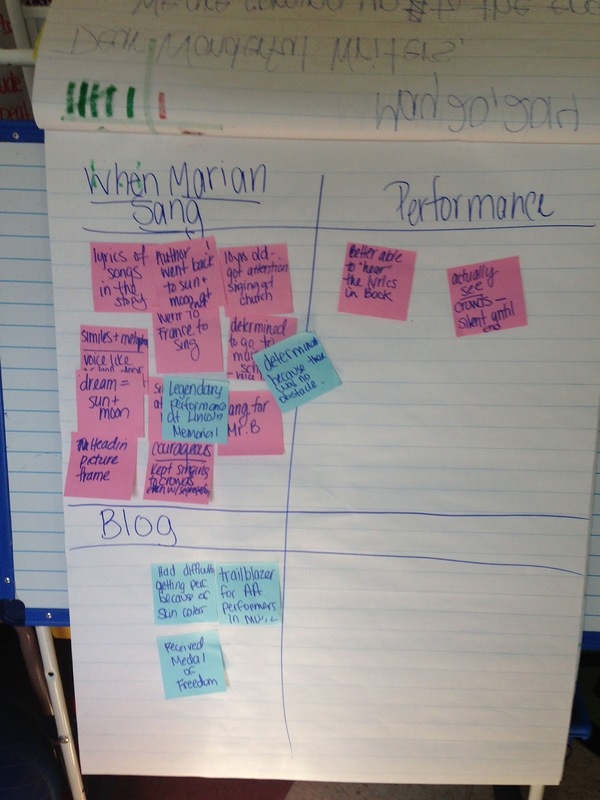 Today I saw a 9 minute mini-lesson where the teacher modeled (she was on day 2 of the gradual release cycle) collecting notes from various sources and them finding similarities and differences among them. This particular third grade teacher, and her co-teacher, wears a tiara during the "I do" portion of gradual release, so all her kiddos know to listen as she demos. Notice how they did the sticky notes in pink yesterday and blue today. Then, after collecting all her notes, she modeled how we find similarities and differences from the three sources - that's where the two blue Post-Its are up at the top, because they repeat. Great way to reinforce the most important bits of information to collect on this event from history! She set the kids off to take important notes from the books they read in Reading Workshop just like she did on these articles. Then, both co-teachers moved to guided reading groups where they facilitated the same discussions, but with books that were instructionally leveled to the students that they taught. So, there you have it - 9 minutes of a mini-lesson modeling to third graders how to collect notes about text and then compare for similarities and differences. And all of this with a tiara on top! I seriously have the best job!